When a three-alarm fire swept through a famous comedy club, investigators suspected typical culprits: table candles, smoldering cigarettes, hot stage lighting. The actual spark? Accumulated grease in ductwork venting a commercial kitchen several floors away. Flames flared to life above the fire suppression system, shot from roof vents and swiftly scorched two floors and the roof, causing $29 million in structural damage – not to mention lost revenue and business disruption. Commercial kitchens are at high risk for fire because multiple ignition sources and flammable items squeeze into compact, high-traffic footprints: open flames, electrical connections, heating systems, cooking oils and fuels, hot appliances, paper products and accumulated grease. Even small fires, fed by fat and oil in tightly packed confines, can escalate in a flash. Grill flare ups, for example, can combust at 1,800 degrees Fahrenheit, igniting grease in the hood above and spreading flames throughout the duct system in minutes. Further, devastating fires – like the comedy club blaze – may catch in hidden areas and entrench before detection systems or staff raise the alarm. 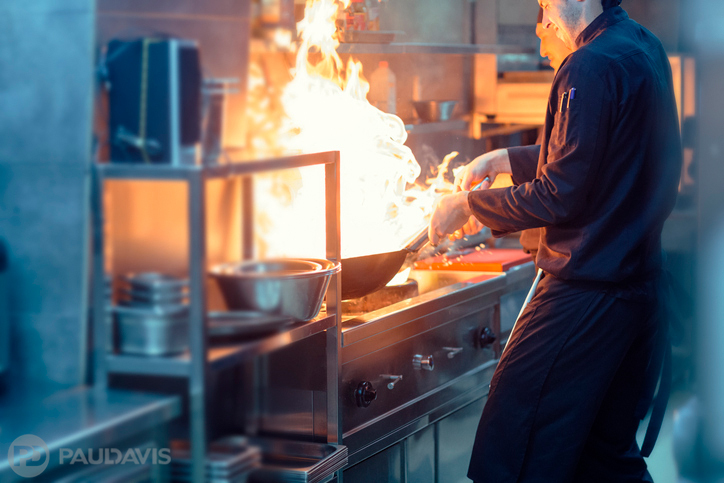 Plan Smartly: Commercial kitchens require specific fire safety measures and regular inspections, many of which are specified by government codes, ordinances and regulations. Hire experts to assess your fire risks before the inspector – who may visit as often as monthly depending on kitchen volume and type – points out shortcomings. Three of five commercial kitchen fires start in cooking equipment and appliances, so is your fire suppression system ready to dispense chemicals automatically or via manual switch? When the system activates, will it immediately cut fuel and electric supply to nearby cooking equipment? Are electrical connections far enough away from ignition sources? Do exhaust fans carry enough heat and moisture away to avoid triggering fire alarms erroneously? These are all prudent questions that seasoned pros address and inspectors verify. Maintain Continuously: Every commercial kitchen requires regular maintenance to boost fire safety. Appliances, electrical equipment, Class K portable fire extinguishers, exhaust fans and vents must be inspected, refurbished, recharged and/or cleaned regularly. Pay particular attention to grease traps, hoods and vent systems and hire trained professionals to clean these areas regularly; greasy exhaust system residue becomes combustible at 700 degrees Fahrenheit. Serving award-winning wood-fired pizza at your restaurant? Up that maintenance budget: solid fuel cooking rapidly deposits creosote and other highly flammable byproducts. Rigorous daily cleaning measures are extremely helpful in reducing risks. Train Adequately: Develop, distribute and give staff time to read, learn and practice emergency and evacuation plans. Then train staff – and drill regularly – on kitchen best practices and fire safety measures. Kitchen best practices may include rules for storing and using flammable liquids and chemical solutions, steps for avoiding clutter, ensuring cigarette safety, and responsibility to closing or opening the kitchen. Train staff to operate fire safety equipment such as fire extinguishers and fire suppression systems. Finally, even though commercial kitchens are bustling environments with pressing staffing needs, instruct every new employee about kitchen best practices and fire safety measures as soon as they join the crew. Should a fire ever occur, this is no time for 2nd best®. Paul Davis has seasoned professionals on call 24/7, with mitigation skills, innovative products and cutting-edge expertise to rapidly return your business to profitably serving customers.